vacancies are for the MCGM Women and Child development department. There are total 137 Community Organizer vacancies in Municipal Corporation of Greater Mumbai. Interested candidates can submit their application for to MCGM on or before 03-11-2017 along with all necessary documents. Selection for this MCGM Community Organizer recruitment will be through written test/ interview. For application procedure, selection criteria of this BMC recruitment Community Organizer Jobs of Mumbai MCGM notification are given below. There are total 137 vacancies in Mumbai MCGM Recruitment. Post Name: Community Organizer -137 Posts. Candidates must have qualified degree from any recognized university. Must have computer knowledge for applying these vacancy. As on 03-11-2017 candidates age limits are 18 to 37 years. For reserved candidates age limits are 18-43 years. Based on received applications MCGM will shortlist the candidates for interview or written test. 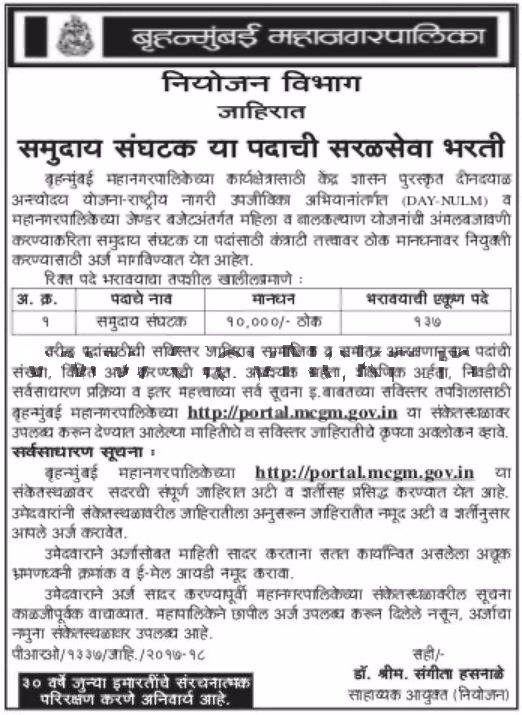 Those candidates eligible list will be displayed on MCGM website of www.mcgm.gov.in in due course. Candidates who have the necessary educational qualification they can submit the application for to MCGM Mumbai on or before the closing date of 03-11-2017. Candidates may send the application form in a prescribed format to MCGM. 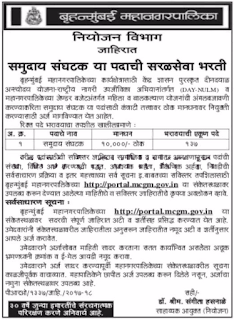 Application form is available for at MCGM website. Download Notification for Mumbai MCGM Community Organizer Recruitment Walk in Interview Notification 2017.